New tools for update delivery optimisation, device management and reducing user distractions are among the features included in Microsoft’s Windows 10 April 2018 Update. The latest Windows update, which begins to become available for download from 30 April and start to rollout to Windows 10 PCs worldwide on 8 May, contains a number of enhancements for what the software vendor refers to as managing “modern desktops”. Among the new offerings are delivery optimisation enhancements that allow for one device to download an update and then use the local network to deliver that update to peers. “This significantly reduces bandwidth (by as much as 90 per cent) and that results in a much better experience for everyone on the network,” Microsoft’s enterprise mobility corporate vice president Brad Anderson said in a blog post. At the same time, Windows AutoPilot, a key part of a flexible device management approach, starting with the Windows 10 April 2018 Update, now includes an enrollment status page. 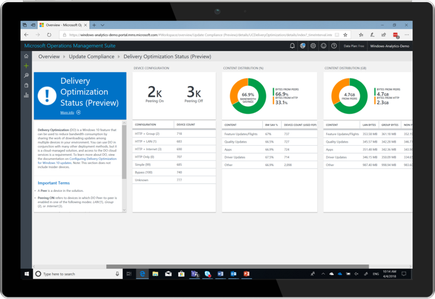 This new enrollment status page is designed to help users ensure policies, settings and apps can be provisioned on a device before the user gets to the desktop and begins interacting with the device itself. Meanwhile, the latest Windows 10 update includes a new feature called Timeline which, on Windows 10 PC, lets users go back in time to find things such as what they were working on it earlier today, last week, or a few weeks ago. “You can even pick up what you were doing if signed into your Microsoft account while using Microsoft Edge or Office 365 on your iOS or Android device when you return to your Windows 10 PC,” Microsoft Windows and Devices Group corporate vice president Yusuf Mehdi said in a blog post. Another new tool to be introduced with the latest update is Focus Assist, which is designed to help users get things done without distractions like social media or other notifications. It can be set to turn on automatically at certain times during the day for focused time. “We’re also helping you focus while on the web with updates to Microsoft Edge. You can now click the audio icon to mute and unmute a tab that is playing sound,” Mehdi said. In fact, the April 2018 Update brings a variety of new features to Microsoft Edge, including full-screen reading, clutter-free printing, grammar tools and autofill on web forms, as well as the new mute option. The new update also includes an improved dictation feature, designed to make it easier for users to take a note, or write a paper, with just their voice. “With your cursor in any text field either in Windows 10 or in an app, simply press Win+H and start talking,” Mehdi said.